Hand Cut Natural Cowhide Leather Belt Strap - Made in U.S.
Home > BELT STRAPS > Hand Cut Natural Cowhide Leather Belt Strap - Made in U.S.
Hand Cut Made In USA Heavyweight Natural One Piece Full Cowhide Leather Belt Strap, Custom size and width. Belt strap comes with silver snaps for interchangeable buckles: Just snap off and snap on. 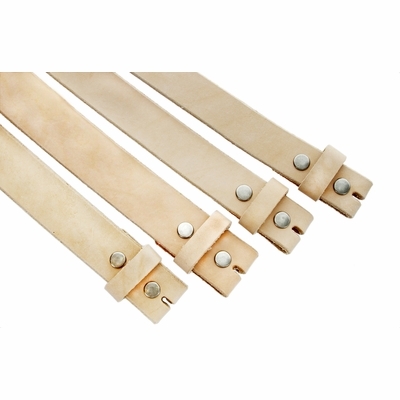 Belt strap is measured from where the leather ends at the fold for the buckle to the middle hole at the tip end, belt strap comes with 7 holes at the tip end.